Ecostrad VeeSmarts provide a smart heating solution that's both versatile and visionary. Finished with flat vertical columns, these radiators add a stylish accent to a variety of spaces. Our 300w - 800w VeeSmart electric radiators are available with free next working day delivery. You can choose your delivery date from our calendar at the checkout. Next working day delivery dates are available when you order before 12pm (excluding weekends). Due to its weight, our 1000w VeeSmart is delivered on a pallet. Pallet deliveries are charged at just £39.99 per order. This charge covers every item on your order, no matter how many items you purchase. All pallets are delivered roadside so please be aware you will need someone on hand to sign for the delivery and move the item into your property. To avoid injury, we strongly recommend having 2 or more people for the lifting. Few electric heating solutions offer the prestige of the Ecostrad VeeSmart, with its high-quality steel body, sophisticated design and precision control. These designer radiators fulfil two room requirements in one: providing comfortable and efficient heat, as well as an elegant accent to any design scheme. This version of the VeeSmart has a horizontal body finished with a glossy arctic white powder coating, allowing it to blend harmoniously with any interior décor style. How does the Ecostrad VeeSmart work? 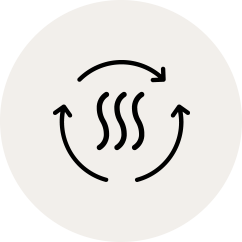 Rather than using heated water as a medium for transferring warmth, the VeeSmart is pre-filled with an effective thermal oil to evenly spread heat across its surface. As the VeeSmart is a sealed unit and works independently of any larger system, there’s no messy installation or laborious extension of pipework required. Each VeeSmart comes with an intelligent electric heating element which heats the oil inside the radiator body. 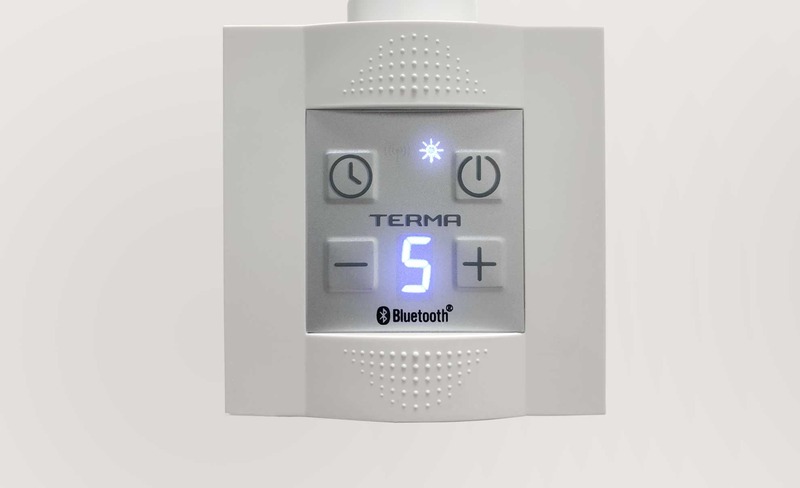 This Terma KTX 4 Blue element comes with a host of heat management options, and even a 24/7 programming facility, so you can adjust your home’s heating with an even greater level of precision. Is the Ecostrad VeeSmart programmable? The Ecostrad VeeSmart electric radiator is designed to be as efficient and as user-friendly as possible, which is why it comes with an intelligent heating element compatible with Bluetooth control. 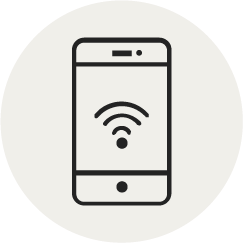 By downloading the BlueLine heating app, you can pair as many VeeSmart radiators as you want to your mobile device via Bluetooth and create bespoke 24/7 heating schedules for each individual radiator. Heating your home on a room-by-room basis isn’t just convenient – it’s by far the more economical solution compared to conventional methods. By taking into account how you like to use your rooms, you can zone your heating so that your interior spaces are only heated to comfort levels at times when you know they’ll be in use. All of the secondary areas of your home – such as offices and guest rooms – can be heated to lower levels, helping to reduce your overall energy consumption. The BlueLine heating app can be downloaded for free via the App Store or Google Play and is compatible with Android 4.4 and iOS 6 devices. Can I control the VeeSmart via Wi-Fi? 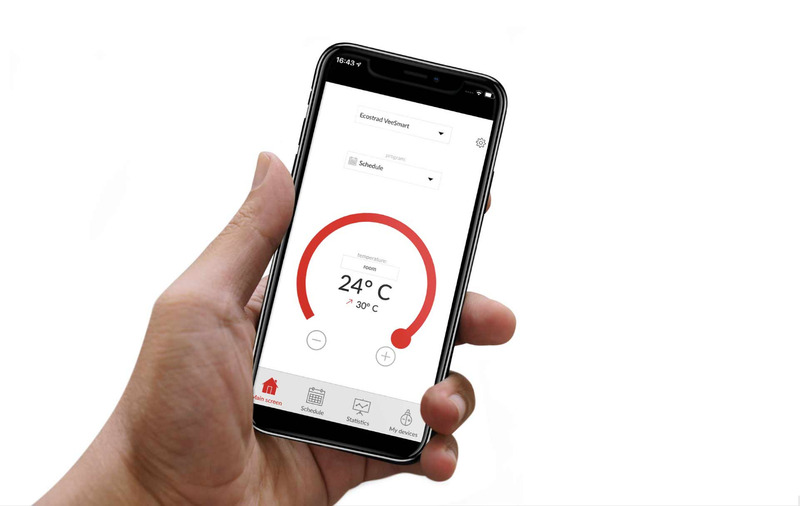 The Ecostrad VeeSmart can be programmed via your smartphone or tablet by using the BlueLine heating app, however it does not use a Wi-Fi internet connection to communicate changes to your radiators. The heating element and the app use short-wave Bluetooth only so your mobile device will need to be within relatively close proximity in order to adjust your heating. You can amend your heating schedules via the app even if you’re outside the range of your radiators but the changes will not take effect until you return home. How do you install the VeeSmart? VeeSmart electric radiators must always be installed by a qualified electrician. They are not supplied with a fitted plug and are not designed for DIY installation. Although you won’t be installing your VeeSmart radiator yourself, this is a straightforward task for an experienced electrician and can be fitted in a short period of time without the need for expensive callouts. VeeSmart radiators use an electric element so installation is merely a case of wiring the heater to the mains. There’s none of the time-consuming effort or cost of extending pipework. Please be aware that the KTX 4 element comes in the same box as the radiator body but will not be attached – additional assembly will be required by your installer. Many of our VeeSmart radiators are quite heavy so we advise having two people to help lift and secure the heater in place. VeeSmart radiators are suitable for use in bathrooms, however they must be installed at least 1m away from any water source in order to preserve the finish of the heater. Can I dry clothes or towels on the Ecostrad VeeSmart? Some materials, such as polyester, are very temperature sensitive and can be damaged by high heat levels. Always ensure that the material you hang on the radiator is suitable for this type of drying. Never dry materials with bleeding dyes on your VeeSmart, such as new towels, as these can permanently stain the white finish. Do not dry any chemical-soaked materials on the radiator as these can also cause discolouring or corrosion. The 8-year warranty on the VeeSmart’s powder-coated finish does not cover damage of this kind, so always use common sense when drying any towels and clothes on the radiator. Though the Ecostrad VeeSmart does allow clothes drying, please be aware that this is absolutely not the case for most electric radiators. Drying damp fabric on electric heating products can cause a serious risk of fire because it can obstruct the thermostat or any necessary ventilation. The VeeSmart is different as its steel housing is fully enclosed and the thermostatic element stands clear from the base. Always defer to the manufacturer’s guidelines before drying clothes on any electric radiator. 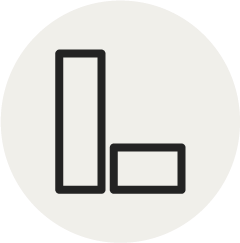 Which are more efficient: black or white radiators? This is a common question and one that divides a certain amount of opinion, but the one point everyone can agree on is that the difference is so insignificant, it’s not even worth considering. 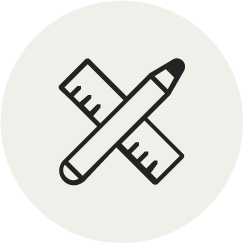 To cut a long story short, there is a miniscule difference between them but the variation in efficiency is mostly affected by the material of an object rather than the colour. Two radiators that are identical in all but colour will emit the same amount of radiant heat, although the composition of the pigment can cause some very minor variations. In comparison to a more insulating external layer, such as chrome plate, there will be a more noticeable difference in efficiency. Black radiators are perceived as being more efficient than white radiators because black surfaces absorb and emit radiation better than any other colour. White, on the other hand, reflects and absorbs the least amount of radiation. This same principle applies to the age-old advice of wearing white on hot days rather than black: wearing a black t-shirt will leave you baking in the hot sun, whereas a white t-shirt will help keep you a little cooler. ‘Why does this not apply to radiators?’ you may wonder; well, it’s all down to the nature of infrared radiation and how radiators heat. While it’s true black surfaces are great at absorbing and emitting radiation, this depends on the type of radiation in question. Infrared has longer wavelengths compared to visible light and so it has different properties. All colours perform fairly similarly when it comes to emitting and absorbing infrared, so there’s not a lot of savings to be had by opting for a black radiator over a white one. 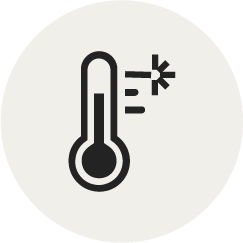 Roughly 2/3 of the heat produced by electric radiators is delivered as convection rather than radiation, which means that they primarily rely on heating the surrounding air. 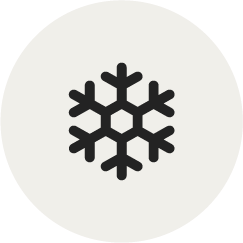 This means that even though a black radiator may emit slightly more radiant heat, it will have no discernible effect on the bulk of the heat produced by the radiator. Ecostrad are committed to providing customers with the very best products at affordable prices. The Ecostrad products we stock provide unparalleled control and efficiency to help customers keep their energy consumption as low as possible, whilst at the same time enhancing their overall ease-of-use. Ecostrad offer heating solutions that encompass a wide range of styles: from sophisticated designer radiators, all the way to low-cost panel heaters.